This is some awesome chili, if I do say so myself, and it's completely worth the time it takes. So be sure to have some extra beer on hand while you're cooking and have fun! Make it as far ahead of time as you can. It really benefits from a long, slow simmer and gets better overnight. It also freezes well. Below are amounts to make your chili powder; you can always use 1 cup of store-bought chili powder (I like ancho chili powder if I'm using pre-made). The ground chili peppers below can be found in most grocery stores in the spices or Mexican sections. -> For mild chili, use only mild New Mexico, California, or Pasilla ground peppers. -> For medium, use 3 tbsp. mild and 2 tbsp. medium peppers (I like Guajillo or Ancho). -> For hot, use 2 tbsp. mild, 2 tbsp. medium, 1 tbsp. hot peppers (such as hot paprika or cayenne). Combine all ingredients well and toast in a skillet on medium heat for 2 minutes. Remove to a bowl and set aside. I prefer to cook dried beans myself instead of using canned beans. If you want to use canned, use three 16-oz. cans of pinto, white northern, or kidney beans. Cook beans, garlic and salt in a large saucepan, according to the instructions on the package, until tender but not mushy. To prepare the beef, I prefer to cut it into chunks and chop it in a Cuisinart or grind it in a meat grinder. I just like the texture better than store-bought ground meat and I can get better quality meat usually. If you don't have the equipment and you do have the time, then chopping the meat by hand is also great. You can control the texture best that way. I'll leave the method and precise texture up to you; the meat can be ground coarsely or finely or chopped into pieces no larger than 1/2-inch cubed. Tip: Make sure you keep the meat refrigerated before cooking. To prepare the onions, garlic cloves, and jalapenos, chop them very finely in the Cuisinart in batches, or mince them by hand. I've found it's best when the mixture is almost soupy from the Cuisinart. In the largest skillet you have, saute the diced bacon over medium-high heat until golden brown. Remove the bacon using a slotted spoon and save for another use. In the bacon fat, quickly saute the chopped or ground meat in batches, seasoning it with 1 tsp. salt, until just browned. Remove the browned meat to a very large Dutch oven, pot or crock pot. In the same skillet, heat the olive oil over medium-high heat and saute the onion-garlic-jalapeno mixture with 1/2 tsp. salt for 6 minutes, stirring frequently. Add them to the cooked meat. Stir the chili powder into the meat mixture and cook, stirring, over medium-high heat for 2 minutes, then reduce to low heat. Meanwhile, pour one cup of beer into the skillet and bring to a boil, scraping up any browned bits sticking to the skillet, until the foam disappears. Stir into the meat mixture along with the rest of the beer (or water), the canned tomatoes, and the red wine vinegar. 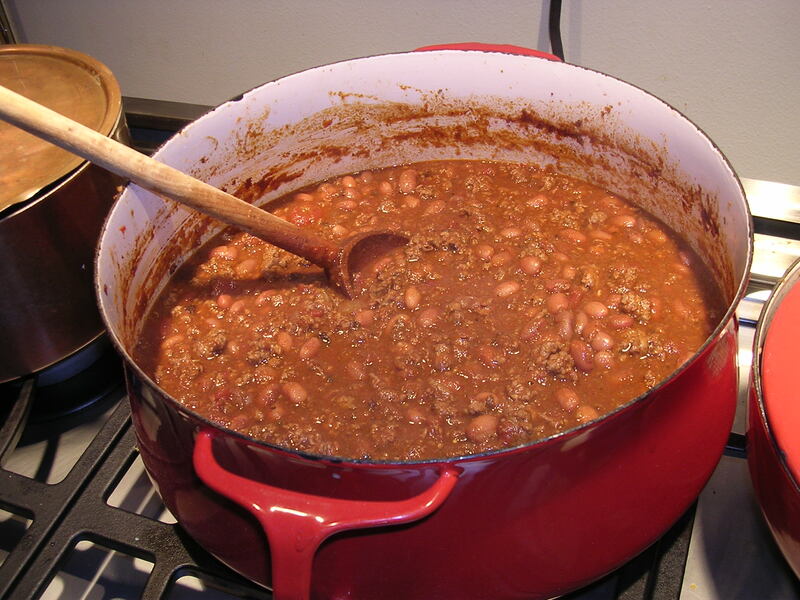 Increase the heat to medium-high again and bring the chili to a rapid simmer, stirring often. Reduce to a very gentle simmer and cook, partially covered, for 2-5+ hours. Stir occasionally, breaking up any large chunks of tomato with your spoon. Near the end, stir in the cooked, drained beans. Check the consistency for your desired thickness and continue simmering uncovered to thicken or add a little water to thin out. Check the taste and add salt, ground black pepper, and red pepper sauce to adjust flavor and spiciness. Serve in bowls with grated cheese and chopped onions as toppings and, of course, beer to drink. To make pepperbellies (which we love! ), pour the chili over a heaping handful of Fritos-brand corn chips and top with cheese, onions, salsa, sour cream and pickled jalapenos.